1. The first time that players make a stack of five trail cards, the player who played the fifth card chooses whether to put the first card played or the fifth card played on top of the stack. From then on, players always place the first card played on top of the stack (so the trail connects). 2. Crossing a river is treacherous. Follow the instructions on the card to try to ford a river. One player must successfully ford the river before any more Trail Cards can be played, so if a player dies, loses a Supply Card, or if nothing happens (by rolling a 3 or a 5 on the “Lose a Supply Card” River Card), play passes to the left. 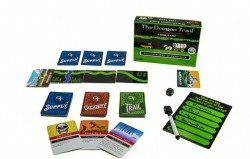 The next player does not play a new Trail Card; s/he rolls and follows the instructions on the most recent Trail Card played. This continues until one player fords the river. 3. When players run out of Trail Cards, they pick five more from the Draw Pile. 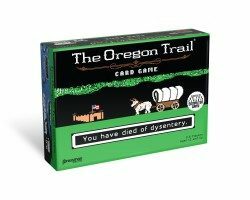 How Will You Die on the Oregon Trail?